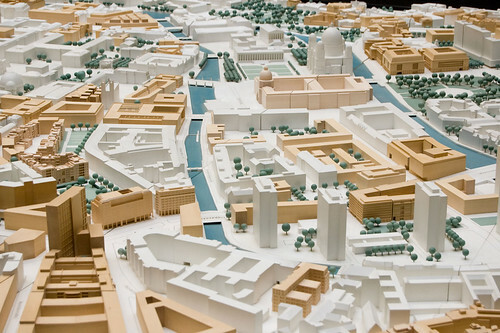 Exhibition in Berlin's senate office of city planning. What you see here is a small view of a quite large model with the changes (shown in brown) that the city already went through or will get through. Looks significant, doesn't it? This is the area around the famous boulevard "Unter den Linden" and around the Berlin dome. If you look closely at the upper right corner there is a building in a lighter brown. That is the planned reconstruction of the Berlin Citypalace which was destroyed by the government of the GDR after the war. The "people's palace" that was built in its place is being torn down right now.